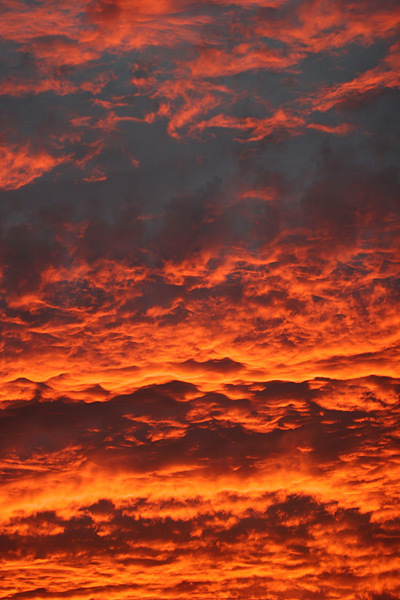 I took this photo of a particularly fiery sunset on November 10, 2005 here in Tucson. Sunlight is made up of a rainbow of different colored wavelengths of light, and when all visible wavelengths are equally present, the light appears white. Air molecules along with dust, pollutants, and other particulates in the atmosphere scatter away some of the shorter wavelengths of light like violet and blue. When the sun is high in the sky and the light is shining mostly straight down through the atmosphere, only a little of these shorter wavelengths are scattered and the sunlight appears white to pale yellow. Sunsets are orange or red because the slanted, low-angle sunlight has to pass through much more of the atmosphere to reach the ground, especially more of the denser and dusty, hazy, and/or polluted atmosphere near the ground, and this can scatter away the shorter wavelengths of light, leaving mostly the longer wavelengths of orange and red light.